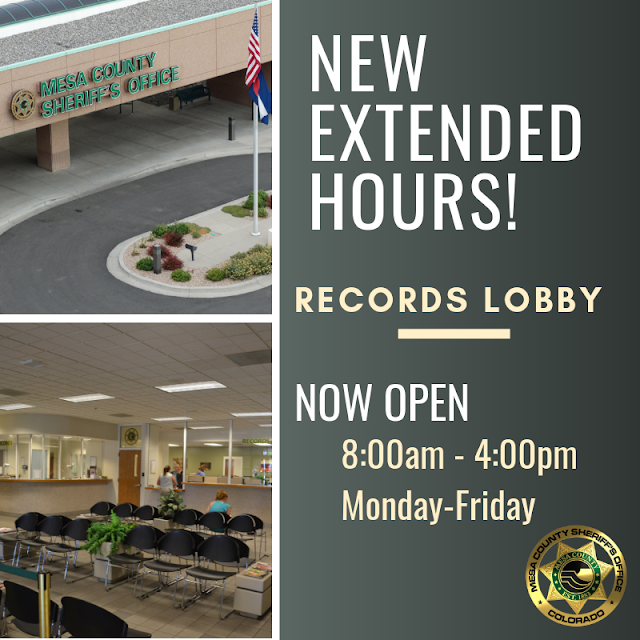 The Board of County Commissioners proclaimed January 27 through February 2, 2019, as National Coroner & Medicolegal Death Investigator Week in Mesa County and call upon residents to take this opportunity to thank our local Coroner and Medical Death Investigators for the hard work they do in our community. Pictured above (from left to right): Commissioner John Justman, Coroner Victor Yahn, Commissioner Rose Pugliese, Investigator Nina Strayhorn, and Commissioner Scott McInnis. Not pictured here is Investigator Chuck Nelson who was covering the office. On Monday, January 28, 2019, Terry Nash was honored at the Commissioners' Administrative Public Hearing for being an outstanding Road and Bridge Department employee as well as a decorated Cowboy Poet. During his 14 years of service to the citizens of Mesa County, Terry Nash demonstrated extraordinary commitment, and dedication beginning as a temporary employee and retiring as an equipment operator for the Appleton District. As an artist, Terry Nash was named 2018 Male Poet of the Year by the International Western Music Association (IWMA). Nash’s CD “A Good Ride” was also named Cowboy Poetry CD of the Year. Awards were held November 10 at the International Western Music Association’s 2018 Awards of Excellence in Albuquerque, New Mexico. Congratulations, Terry! Mesa County Clerk and Recorder Tina Peters (at podium) and Chief Deputy Heather Benjamin ask the Board of County Commissioners to consider approving a lease agreement between Mesa County and the City of Fruita to rent a portion of the city's administration building to provide motor vehicle licensing services, in the amount of $150.00 per month for a term of February 1, 2019, to December 31, 2019. The agreement was approved on a two to one vote. Fruita Mayor Pro Tem Lori Buck urged the Mesa County Commissioners to approve the lease that enables the motor vehicle office to reopen in Fruita to better serve the residents of Mesa County. 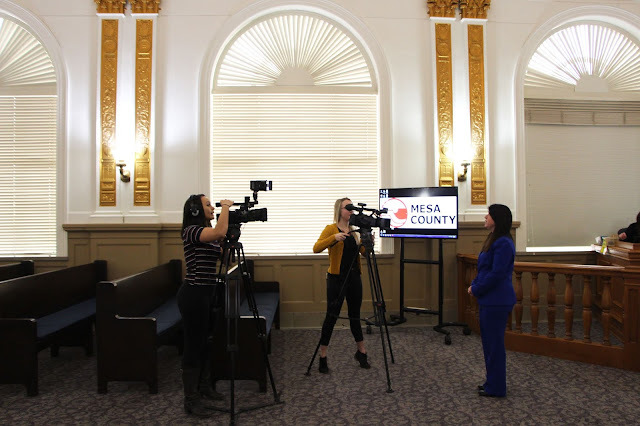 Mesa County District Attorney Dan Rubinstein requested an increase in staffing level by one full-time position for a new Restitution Coordinator in public hearing Monday morning. The District Attorney’s Office manages the Victim’s Compensation program, and also assists in assuring that victims get restitution ordered by the court. In 2017, the DA’s Office applied for a Justice Assistance Grant (JAG) to fund a Victim’s Compensation Coordinator which was awarded for one year only, but not funded. The DA’s Office prioritized the Victim’s Compensation Coordinator position over a Restitution Coordinator position and created the position with existing funding in place of funding a Restitution Coordinator. The JAG funds have now been approved and released to the DA’s Office and must be used for the one year to fund the Victim’s Compensation Coordinator thus freeing up one year’s funding for the Restitution Coordinator. The authorization staffing level of the DA’s Office is increased by one regular position to provide for a new Restitution Coordinator. If during the 2019 fiscal year the DA’s Office does not receive alternate, non-county dollars to cover the ongoing costs of the Restitution Coordinator, then the new position and commensurate authorized staffing level increase will sunset on January 1, 2020. Melissa Matteson with the District Attorney's Office was recently promoted to Administrative Supervisor. Melissa has been with Mesa County for 20 years. Congratulations on your promotion, Melissa! 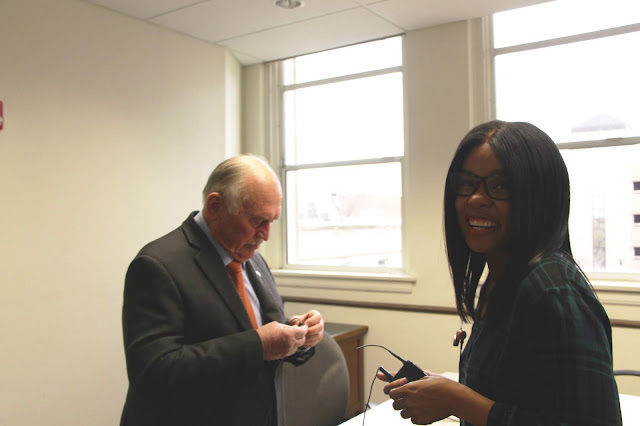 Interim Library Director Shana Wade and Board President Barry Blanchard gave the Mesa County Commissioners a semi-annual update of the Mesa County Public Library. Interim Library Director Shana Wade talks to the Board of Mesa County Commissioners about the priorities and mission of the Mesa County Library and its branches. Mesa County Commissioner Scott McInnis talks to KREX News Channel 5 Reporter Ivan Fisher about a new trend among libraries, to add social workers to their staff. Watch the interview at https://bit.ly/2WC3VFD. Chairwoman of the Board of Commissioners Rose Pugliese talks to KREX, KJCT, and KKCO news reporters about the Jordan Cove Project. Watch the interviews at https://bit.ly/2TtKmxq and https://bit.ly/2SkAHvD. Mesa County Commissioner John Justman talks to KREX News Channel 5 Reporter Star Harvey about his vote on the lease that enables the motor vehicle office to reopen the Fruita branch. Watch the interview at https://bit.ly/2TpZFXZ. Commissioner Rose Pugliese testified remotely in support of HB19-1062, which will give Mesa County the option to purchase the Grand Junction Regional Center. Learn more about the bill at http://leg.colorado.gov/bills/hb19-1062. 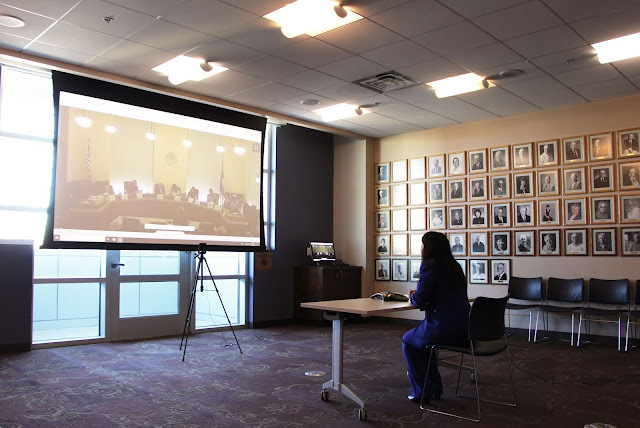 Mesa County Commissioner Rose Pugliese, President of the Grand Junction Area Chamber Diane Schwenke and Executive Director of the Grand Junction Economic Partnership Robin Brown testified remotely in support of HB19-1062. 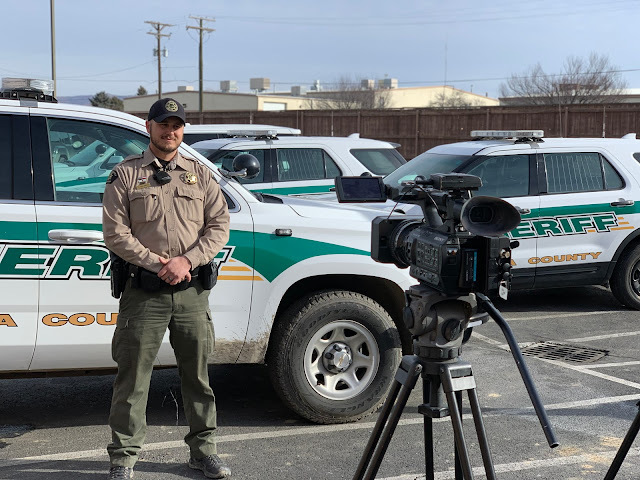 Mesa County Sheriff's Office (MCSO) Deputy Troy Rolbiecki gave an interview regarding the woman's life he saved who had crashed on Highway 141 and had been trapped in her vehicle for hours. Criminal Justice Services leadership gave the Mesa County Commissioners and Administrator Frank Whidden an update on their operation and programs. Pictured above: CJSD Director Matt Sullivan (center) gives an update. CJSD director and managers give the Mesa County Commissioners an agency update. The Mesa County EPR team moves supplies that will be donated to Project Cure from the state Emergency Medical Cache. The emergency medical supply warehouse is moving to a new location and will begin a new phase that will include a partnership rotation program that will ensure that surge medical supplies are always in reach! EPR Program Manager Greg Rajnowski is on the forklift helping with the emergency medical supply warehouse relocation. EPR Program Specialist Vince Burkhardt helps with the warehouse move. 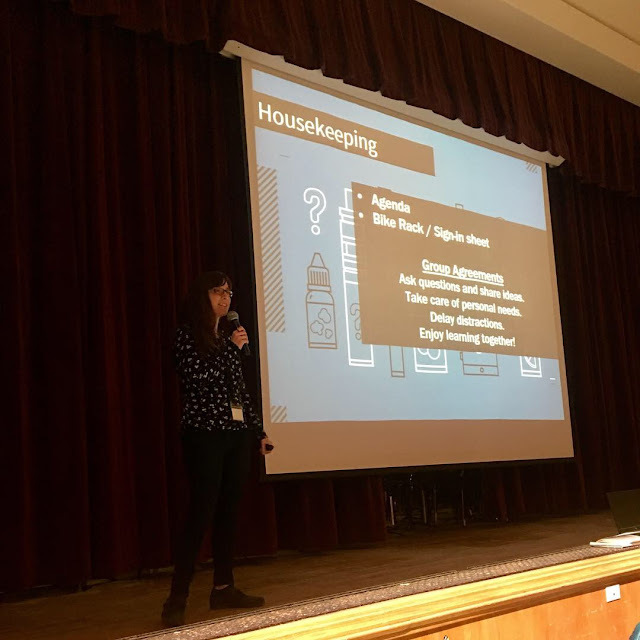 MCPH Health Promotion Specialist Kelsey Fife gave a teen vaping prevention presentation Thursday night in Fruita. 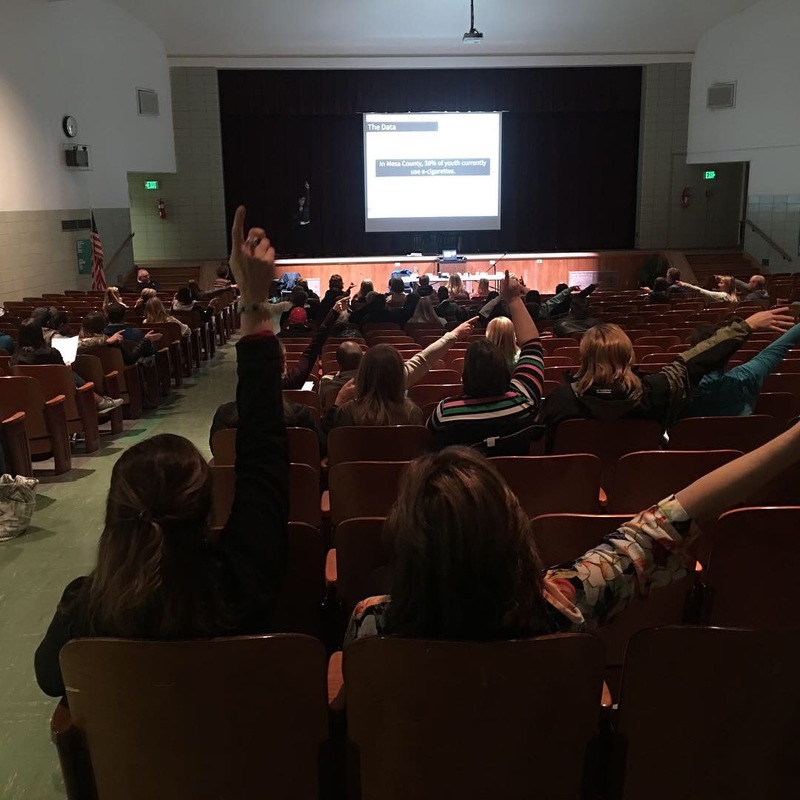 Parents and teens came together to learn more about the risks involved with vaping. Visit healthymesacounty.org to learn more! Presentation attendees participate by asking questions about the risks of vaping. 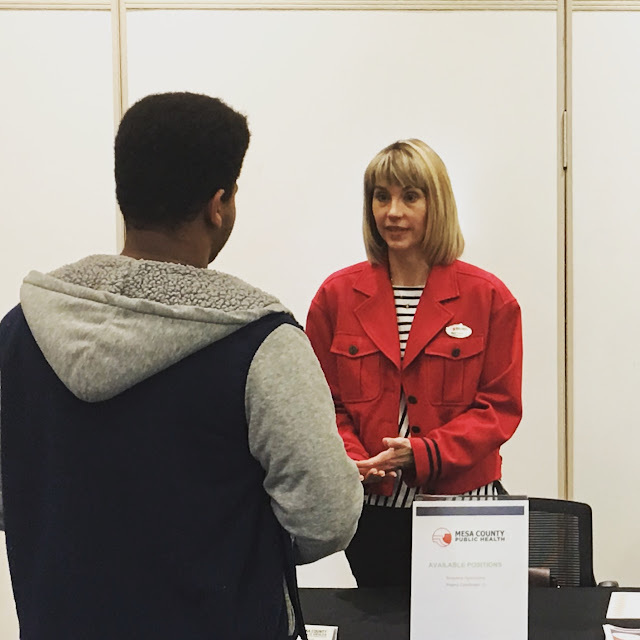 MCPH Administration Manager Mary Cornforth chats with a student at the CareerWise Apprentice Fair on Wednesday night.